Els Quatre Gats (Also called 4 Gats) Barcelona bar and restaurant on Carrer Montsió, 3 in the gothic area of Barcelona. Els Quatre Gats was modeled on Le Chat Noir in Paris and is now famous for being the favourite bar for young Barcelona artists and writers in the years between its opening in 1897 and the six years until it closed in 1903. It was later reconstructed in 1978. Among the now famous artists who gathered at Els 4 Gats was artist Ramon Casas, who also financed the interior decor of circular chandeliers and the mediaeval furniture designed by Modernist architecht Josep Puig i Cadafalch. He also painted the painting of two men on a tandem bike for Els 4 Gats. The painting is titled "Ramon Casas and Pere Romeu on a Tandem". Pere Romeu was the owner of the 4 Gats. He is at the front of the tandem bike. Behind him is Ramon Casas smoking a pipe. This painting is still on the wall in the 4 Gats bar, but it's a copy. The original is in the MNAC museum in Barcelona on Montjuic hill. Other regulars included artist Santiago Rusiñol and Pablo Picasso and his good friend Carles Casagemas. 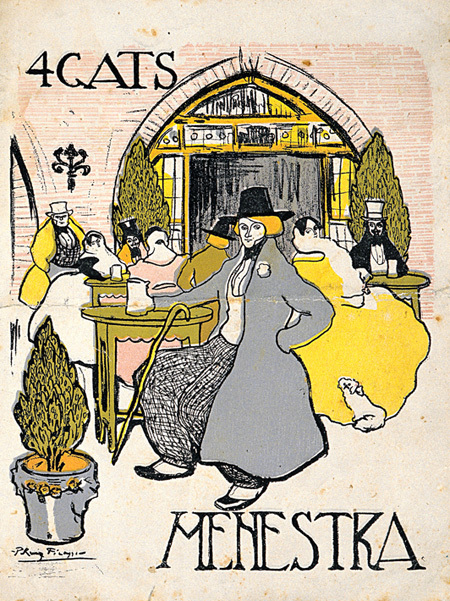 Picasso designed the 4 Gats menu in 1899 which is still in use. Els Quatre Gats has some of the atmosphere of the modernist artists but the food gets mixed reviews. Els Quatre Gats was a favorite cafe and meeting place for artists in Barcelona. the beginning of the 20th century, The most famous Pablo Ruiz Picasso who lived with his family in Barcelona and studied art here. This restaurant hosted Picasso's first public exhibition. The restaurant is in a modernist building constructed in 1897 by Josep Puig i Cadafalch. It was commissioned by relatives of Francesc Vilumara who was a textile magnate. It stands at Carrer Montsió, 3, Barcelona.Els Quatre Gats is on a side street on the left off the pedestrian walking street Puerta del Angel just a short walk from Plaza Cataluna. If you are a modernist or Picasso fan then worth a visit.